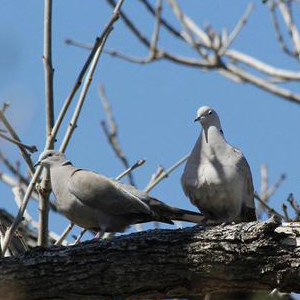 According to a recent public notice posted by the Texas Parks & Wildlife Department (TPWD), a number of Eurasian collared doves (Streptopelia decaocto) near El Paso have tested positive for avian paramyxovirus, specifically Pigeon Paramyxovirus-1, or PPMV-1. Dead doves have also been reported in Alpine, Texas. Past outbreaks have been observed in the vicinity of many of the larger urban centers of the Trans-Pecos and Panhandle regions such as Midland, Lubbock and Alpine, but outbreaks may occur elsewhere within these regions. The majority of PPMV-1 outbreaks in wild birds in the United States have involved Eurasian collared doves and rock doves (pigeons). Symptoms include doves becoming lethargic and reluctant to move, producing green diarrhea, or having difficulty in standing or holding their head upright. The virus can cause conjunctivitis (pink eye) in humans, therefore, if you encounter multiple dead or dying doves, do not handle the birds without hand and eye protection. There is no known risk to cats or dogs from PPMV-1, but the TPWD recommends keeping pets away from infected birds. Some strains of PPMV-1 have been shown to cause disease and death in domestic poultry. Chickens can contract the disease from indirect contact such as dove feces in chicken feeding areas. Therefore, backyard chicken owners may want to take precautions to minimize potential contact between chickens and doves.